My life has many soundtracks. Sesame Street and Walt Disney songs are my earliest recollections. I had a kid’s record player and still have singles like “There Are Five People in My Family,” “It’s Not That Easy Being Green,” “The Alphabet Song.” I was also a big fan of the Mickey Mouse Club. Old time-y church hymns also remind me of my childhood. (I’m Lutheran; we sing – lots!) Not so many weeks ago, “God Be With You ‘Til We Meet Again” in church brought tears to my eyes and the ghostly sound of Grandma Wilt’s strong singing voice right to my mental ear. I remember the raging musical debates over Shaun Cassidy and some other pop star (maybe Andy Gibb?) at the time when I was in 3rd grade. I remember not caring much about either one as a singer, except that Shaun Cassidy was one of the Hardy Boys on TV, so I put myself into his camp. I did have a Shaun Cassidy album I found at a garage sale. It skipped during “Da Doo Run Run“. My dad was a HUGE Beach Boys fan. We’d listen to “Endless Summer” on 8-track in the sky-blue 1970 Chrysler convertible while cruising home from wherever. That album is still THE summer album of choice and must never EVER be played in the winter unless you are in Florida. I think the Beach Boys were the first group I saw in concert at Blossom Music Center – with my parents. It didn’t even feel weird. I think I got my first walkman when I was 12. The whole world was amazed at the thought of carrying your music with you in your pocket (pockets were LARGE back then). The first tapes that I personally owed were Madonna’s “Like a Virgin” and Michael Jackson’s “Thriller.” I have no idea why I received those – I know I didn’t ask for them, but they were “hot” at the time, I guess. Jesus Loves Me was sung at my 8 year old sister’s funeral when I was 12; my kids don’t get why that one makes me cry in church sometimes but one day maybe they’ll understand. I went to high school in the 1980’s, so those are the “oldies but goodies” for me. Certain songs conjure very specific memories of school dances, but nothing I can recall specifically at the moment. When I started dating, every boyfriend of significance left his own musical mark on my life. My first serious boyfriend was – and still is – a Mannheim Steamroller fan. The next long-term boyfriend was a serious Rush fan. Tom Sawyer is my favorite Rush song. The Beatles will always make me think of John. And John Denver, too. I sang the Steven Curtis Chapman song “I Will Be Here” for John at our reception. Still don’t know how I pulled it off without crying. I was the only one NOT teary. Some music crosses life stages. The “Jesus Christ, Superstar” album always comes out this time of year. I have vivid recollections of my younger self flopped on the rainbow-colored shag carpet on the floor in front of the entertainment center in our “New Room” trying to follow along with the lyrics inside the album and figure out their meaning. The several hours of Christmas music my dad taped from the radio some year became THE Petersen Christmas tape, the one we always decorated the tree to. I still have the original tape with his handwriting listing the songs and singers. One of John’s most thoughtful Christmas gifts to me was splicing that tape back together when it broke and digitizing it so I would have it forever. I wouldn’t let him edit it, though. The skips in the “on, on they send; on without end” part of “Carol of the Bells” still give me chills. The Sound of Music meant staying up late to watch the whole movie as a kid, then going to the real places in Europe on the oh-so-cheesy but fun “Sound of Music” tour. We using the wedding processional from the movie in our wedding (sans the ‘How Do You Solve A Problem Like Maria’ motif, though that might have been apt foreshadowing!) and later went on the same Sound of Music tour together and stood in the church where that wedding scene was filmed. Megan’s song is “La La Lu,” the lullaby from Lady and the Tramp. Her CD is called Toddler Tunes because we like alliteration – and also had a toddler running around by then. “You Are a Masterpiece” was the song sung at Meg’s baptism. I have the sheet music saved in case she grows up and has never heard it. It’s a gorgeous song. James Keelaghan‘s music has been a large part of our family life. We discovered and heard him live before we had kids; several of his songs are on our kids’ mix CD’s; and we’ve heard him in concert every few years for a while now (when he can make it down from Canada). A few years back, we took the kids to hear him live in Kent and this coming May, he’s going to be in Columbus so we are all going down to hear him again. There are probably more songs in my life’s soundtrack, but this post is long enough for now. HUGE hat tip to Bonnie at Crib Chronicles for the inspiration for this post! * Fall, 1999: We hear the James Keelaghan song “Rebecca’s Lament” live in concert with its accompanying story about Rebecca Galloway and native leader Tecumsah where we hear the Rebecca’s family’s cabin still stands. 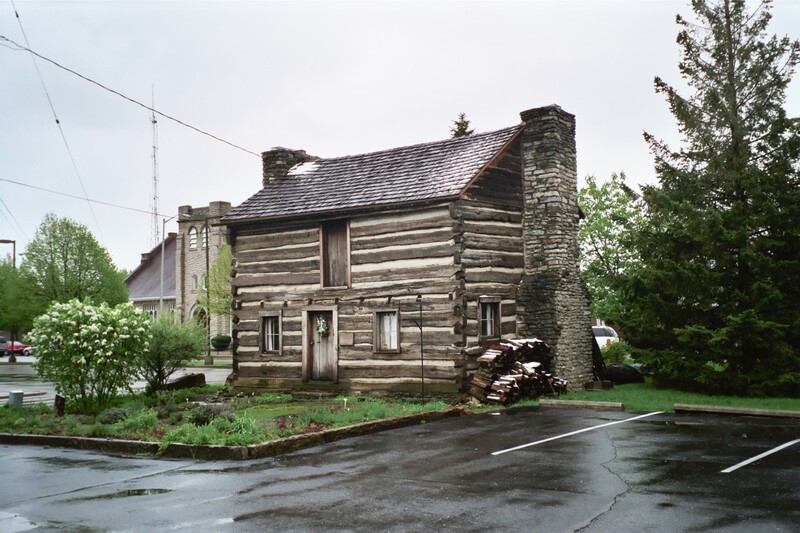 * December, 1999: We go looking in Chillicothe, Ohio for Rebecca’s cabin, said to still exist, then realize it was supposedly in Xenia, Ohio, NOT Chillicothe. After the trip to Chillicothe, the quest languished for 5 and a half years. We saw James Keelaghan in concert several times in those 5 years and thought about the unfinished quest, but we were never near Xenia and the timing just wasn’t right. Then in April 2005, John surprised me with a weekend trip to our alma mater, Miami University in Oxford, Ohio. On the way home in John’s GPS-equipped Acura, we realized that Xenia wasn’t too far off our track home, so the quest sprang to life again. The only info we had was that the cabin was behind a K-mart in Xenia. Luckily, John’s GPS quickly located the only K-mart in town. When we discovered this intersection of Main and GALLOWAY streets just in front of a giant K-mart, we KNEW we were close! We kept driving, trying to get behind the K-mart, which was apparently built right in the middle of Galloway street. Rounding the final corner, we found the cabin! It felt SO GOOD to have completed our quest. We didn’t even care that it was raining! We walked around, learned that you can actually enter the cabin, though not on Sundays. We took a picture of the Ohio Historical Marker, and after 15 minutes, proclaimed this leg of the quest completed. I hope someday we’ll be able to return and tour the inside of the cabin! We next saw Mr. Keelaghan in Lemont, PA on June 11, 2005. We presented him with photos of Rebecca Galloway’s cabin and a summary of the quest his song had inspired. The whole quest was a memorable and fun experience we will never forget! 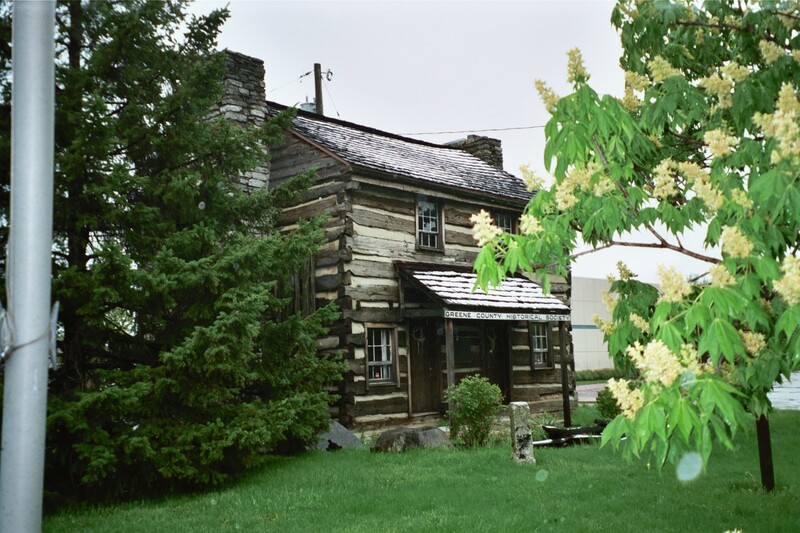 At a show in the fall of 1999 at the now defunct Brick Alley Theatre in Cleveland, James introduced the song and told the story of the cabin where the last part of the story took place. Apparently, the Galloway cabin still stands behind the K-Mart in Xenia, Ohio. We remembered all of this except the Xenia part. 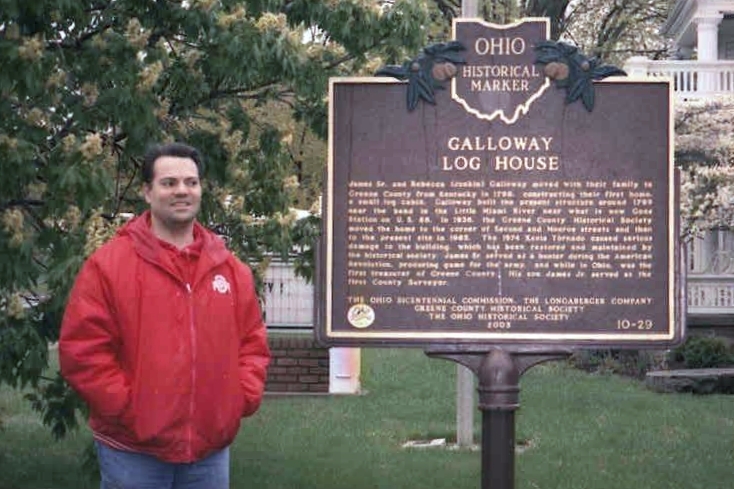 On December 30, 1999, we were returning to Ohio by car from a trip to North Carolina listening to “Small Rebellions.” Remembering the story of the cabin (or, at least, some of the story), we took a slight detour to Chillicothe in search of the cabin. We roamed around the town until we found a state park. The ranger didn’t know anything about Rebecca Galloway and Tecumsah in the Chillicothe area. We drove around a bit more and enjoyed the sights in Chillicothe, but considered our pilgrimage to be a failure. After a bite to eat, we decided to head home. It was getting late, and we still had several more hours to drive before we got home. As you can see, there was no cabin in sight. On the drive home, John suddenly remembered that it was Xenia, not Chillicothe, where Rebecca’s cabin was supposedly located! We resolved to continue our quest another time.